This Spring special includes three of our mini one pound boxes! Each box is hand-picked and hand-packed with our delicious organic Medjool dates and wrapped with colorful satin ribbon! Perfect for Easter baskets, Hostess gifts, Mother’s Day, and more! Mix and match your colors from our assortment of Spring seasonal selections which include pink, green, purple, yellow (as shown), or white. *Specify ribbon color choices in order notes, or we can choose for you! Contains three 1 lb. boxes of California-grown organic Medjool dates. 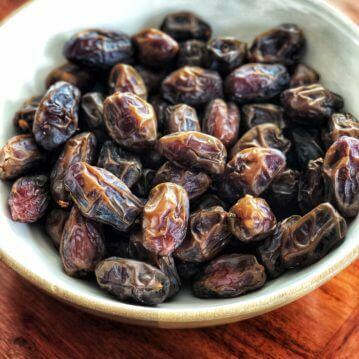 Each box contains approximately 20 whole, un-pitted dates. © 2019 Rancho Meladuco. All Rights Reserved.